First, I’d like to thank both my loyal readers for your patience while waiting me to publish a new post. So thank you Stephanie and Richard. Since I last blogged Justin and Cherise came to Lawton to pick up Justin’s new car. His sis gave him a very nice 2002 Oldsmobile Alero with only 57,000 miles on it because she bought a new car. It’s great for Justin because he had been saving for a couple of years to buy a car so he wouldn’t have to be burdened with car payments. 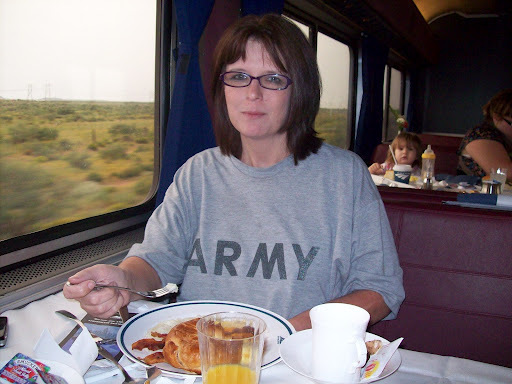 So I rode back to Tucson with them and Cherise’s little sis Ciarre and was in Arizona from September 5 through September 12. 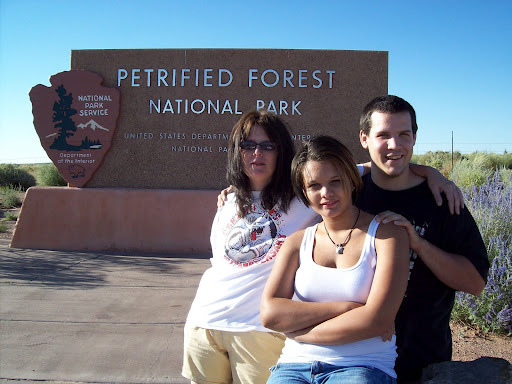 We were gonna go to the Grand Canyon, but we were pressed for time because Ciarre had to fly back to Lawton early on the 7th. 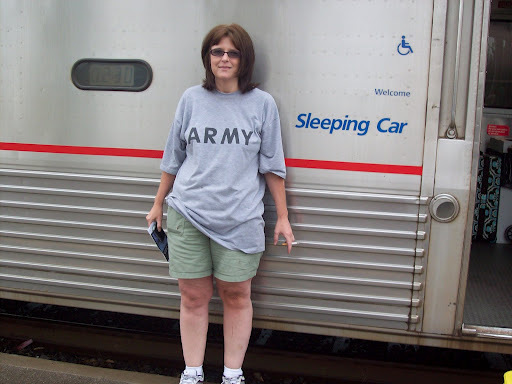 So by the time we got to Winslow we stopped for the night and gave up on the Canyon. 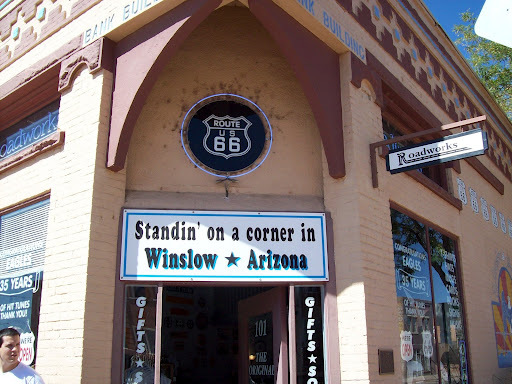 I always wanted to stand on a corner in Winslow anyway and it was a lot of fun. 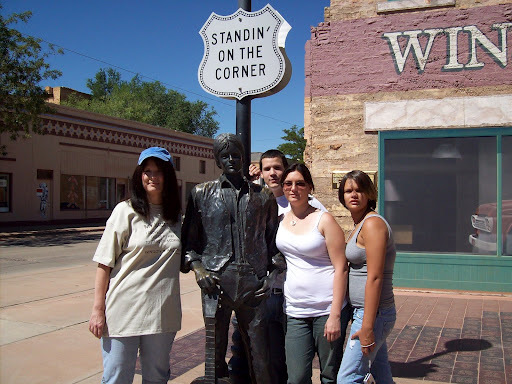 The dude on the corner is still standin there but he’s a statue now. (I guess cause he’s been standin there so long, he was bound to turn into a statue). I have a theory that the girl my lord wasn’t actually slowin down to take a look at him though. I think she had engine trouble and he was just kinda egotistical and naturally assumed she was slowin down just to look at him. 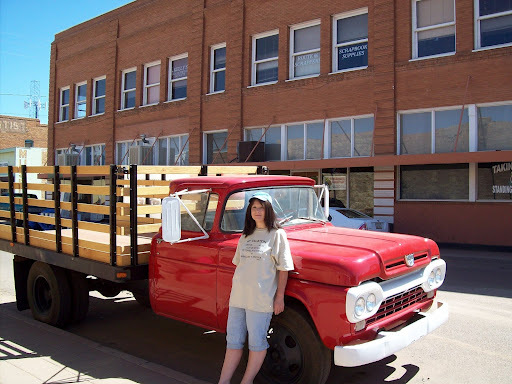 The flat bed Ford is still sittin on the corner which gives merit to my theory. The girl my lord is pretty reclusive these days and it’s probably because she’s old and saggy now and doesn’t want to tarnish her image. I couchsurfed in Tucson with a nice guy named Bruce. He had a beautiful home and a lovely back yard. It was a very nice place to stay. 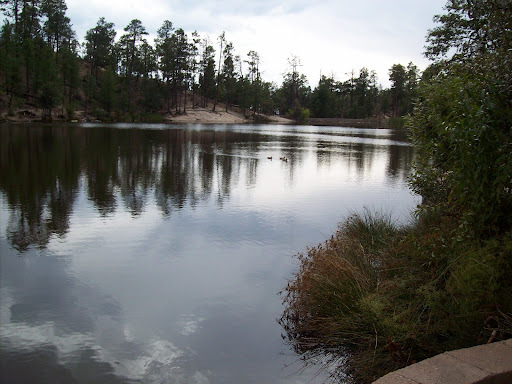 He took me and his friend Toni, his sister and her husband up on Mount Lemmon which is about 10,000 feet high and a 25 mile ride up. It was fantastic. The temperature drops thirty degrees up there and it’s the most beautiful place I have ever seen. 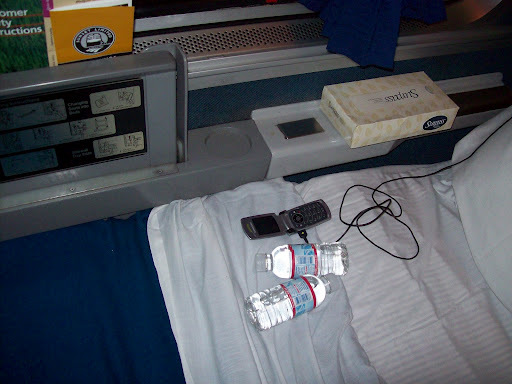 Justin sent me home in style on an Amtrak sleeper. 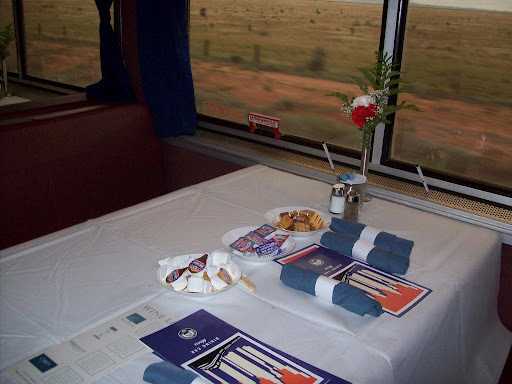 I had a private room on the train and truly loved every second of it. 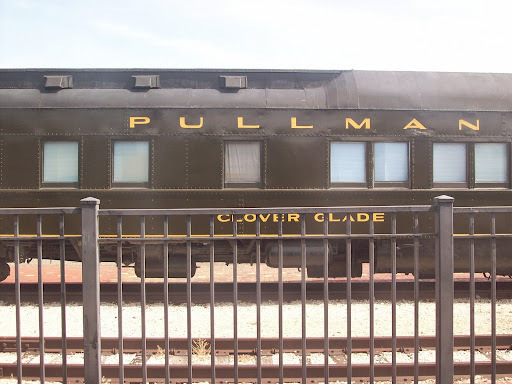 I even saw two Pullman cars somewhere in Texas. The porter told me it was rare to see Pullmans in Texas and that they probably belonged to some rich Texan. 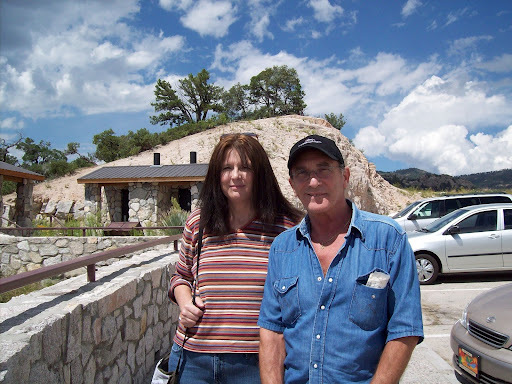 While in Tucson, I met Bruce’s brother in law, Skip who mentioned he was a professional window cleaner. He told me about the business and I thought it would be great for Billy because nobody cleans anything better than Billy. So when I got home I emailed Skip and he has been very helpful in telling us how to get started in the business. Billy loved the idea and we got started right away. We ordered our supplies, and business cards and put an ad in the paper. I have been out prospecting in the evenings and on Saturdays and it’s already paying off. Billy did a job this past Saturday and we are booked this week and we already have three jobs for next week. The pay is unbelievable. He even has one filler job cleaning a house for a family once a week. Skip even made a one page web site for Billy on his own host site. So you can google us! Here’s the link. http://www.cloudmesa.com/billswindowcleaning/. Skip is retired from window cleaning but he creates web sites for businesses, but he did ours for free. I also renewed my insurance license last week because it was about to expire at the end of September. I had to read over 300 pages and take a 50 question test. I was tempted to just skip the reading and just take the test but I decided to just skim over the material and do the chapter review questions. I missed six questions but I still passed. 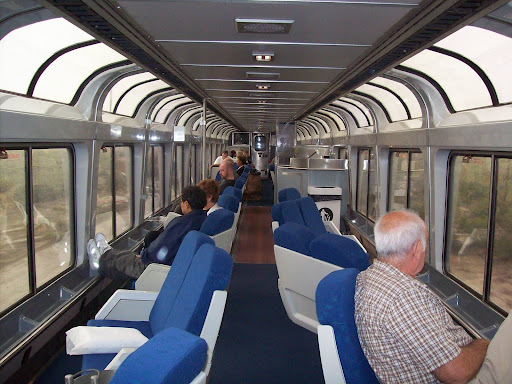 I’ll post some pictures of my Arizona adventure and of my train ride home. 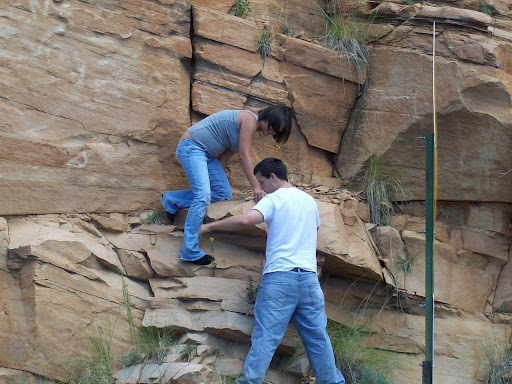 One of the pics is of Bruce and me on Mount Lemmon and one is Justin and Ciarre climbing on rocks on a road between Winslow and Mesa. 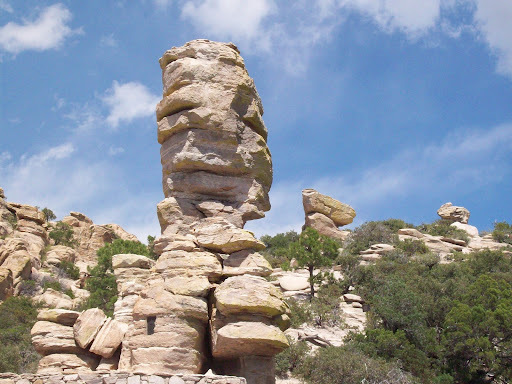 The scenic pics are Rose Canyon Lake way up high on Mount Lemmon and an odd rock formation on Mount Lemmon and I think the rest are self explanatory. Thanks again you two for stopping by! !